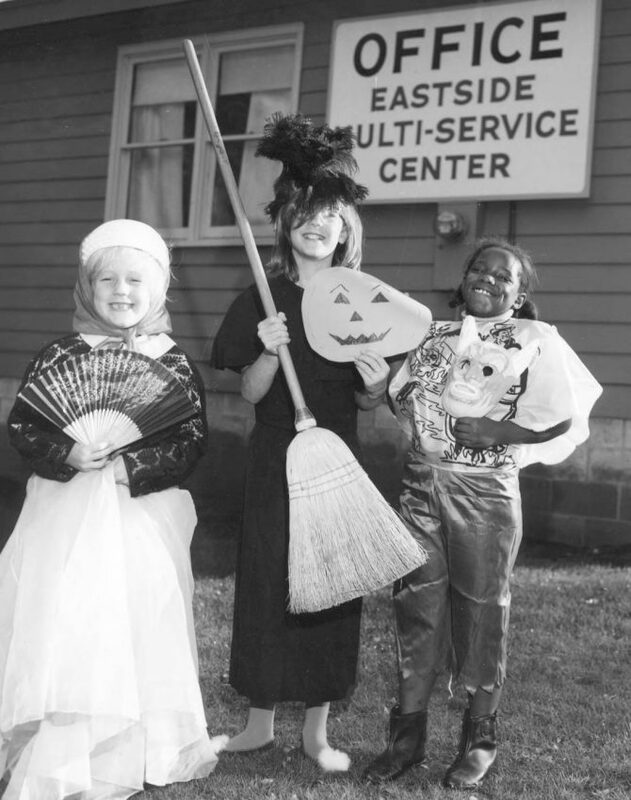 “Official Witch" Chari-Kee Rowell, age 10, is flanked by her court, "Official Princess" Darcy Orr and "Official Devil" Janet Barr, as she prepares to lead the first Eastside Halloween Torchlight Parade which will be held on October 31, 1968. They are standing in front of the office of the Eastside Multi-Service Center, an arm of the Tacoma-Pierce County Opportunity & Development, Inc. Alice Dunn, director, had recently announced that the Eastside Youth Center in Salishan, destroyed by fire on March 30th, would be open in time for the "biggest Halloween party ever held in the Eastside." An anonymous donor had just pledged $2,000 to complete the building fund. Hundreds of children dressed as goblins, ghosts and fairy-tale creations were expected to assemble at Gault and Roosevelt elementary schools to march in two torchlight one-mile parades culminating at the new Eastside Youth Center where they would bob for apples, hunt for pennies in the hay, eat pies and have their costumes judged for prizes.